Home > Uncategorized	> Ta-Daa! Earlier in the year we spent quite some time admiring the Lesser Celandine. Very pretty they were too, particularly as then, there were virtually no other flowers around. Of course the Snowdrops and Daffodils turned up around that time, but they’ve mostly gone now and it’s hard to find a Lesser Celandine flower anywhere either. Suddenly, we have the Lesser Celandine’s larger namesake, the Greater Celandine in the verge (thanks to Wild About Britain for help identifying it). They aren’t actually related at all, and that might be why the Greater didn’t turn up until that little upstart was out of the way. He of course, is a fully paid up member of the poppy family, not a mere buttercup like that Lesser fellow. The plant is fairly toxic – so it’s best not to eat it. It is though, used in herbal medicine and here, it is best to stick to the recommended dose. It will kill or cure a large number of ailments and is either very good or very bad for your liver. 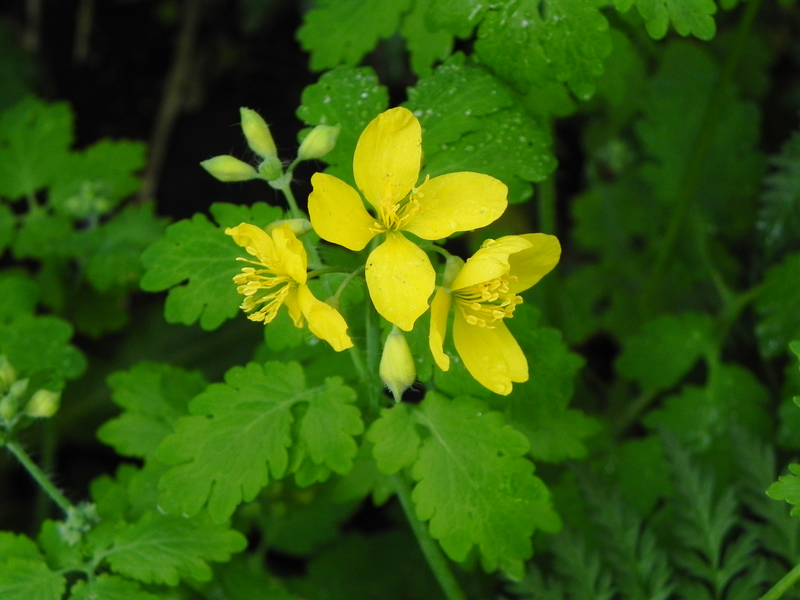 Someone studying Saxon herbal cures, noted that it was necessary for Greater Celandine to be heated very gently, being careful not to let it burn, in a brass pot. They also remarked that there was a specific incantation, or spell, to be said while heating it. This, they thought, was a way of timing the preparation, not a bad idea when you can’t just check your watch.